Pat’s lace gown is gorgeous! With a layer of lace over soft satin, and a cathedral veil, this gown has a beautiful traditional flair! The belt is also made of satin and has a lace detail. 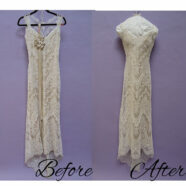 When we got the dress, it was slightly dirty all over, with each hemline being especially dirty. The edge of the veil was also really dirty. 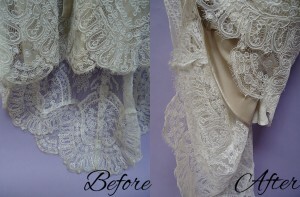 We approached this dress by starting with hand cleaning it, using the Silk Wet Care process. We also carefully spot cleaned the veil and hand pressed the gown and veil. Finally, we finished the process with our Museum Method Preservation. 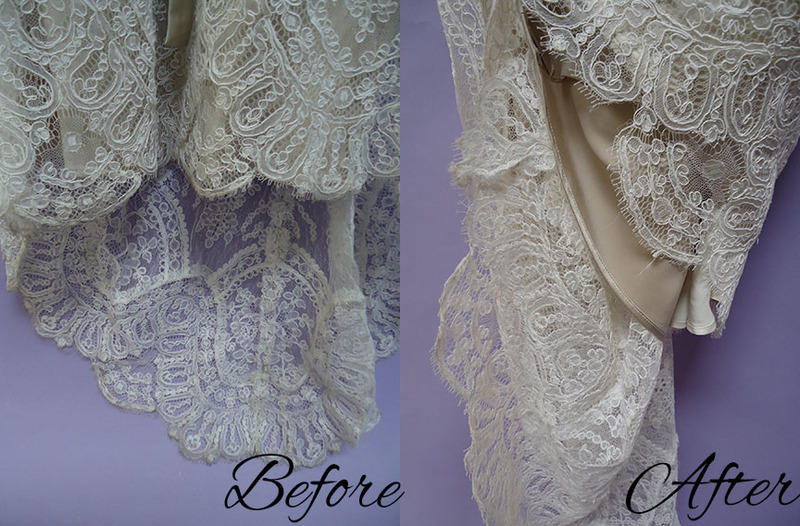 We were able to get the dirt off these lace hemlines. Pat can now look at her clean, beautiful gown any time she would like!